As a follow-up to her exhibition, in this workshop Moira will help you to explore different techniques to create layered surfaces. 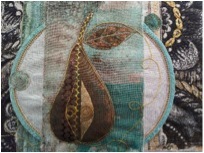 You will work with different fabrics, colouring and manipulating them using printing, bonding and stitch. By the end of the day you will have a selection of lovely samples ready to be combined and made into a small panel or techniques book.